At 76 miles (122 km) south of Agra is located the city of Gwalior in the state of Madhya Pradesh. With a strong historical backdrop, Gwalior is deeply associated with romance and charm. Legends say that Gwalior owes its name to a sage of yesteryears. In fact, Suraj Sen, a prince of the Kachhwaha clan of the 8th century, is believed to have lost his way in the jungle and ultimately rambled up to an isolated hill. At this point of time his meeting with an old man, Sage Gwalipa, changed his course of life. Tired and spent, he asked for some water and the sage led him to a pond. The prince was taken by surprise when he found that after drinking the water it not only quenched his thirst but rid him of his disease of leprosy. Out of gratitude he wanted to offer something to the sage and the sage asked him to fortify the hill. The hill was thus fortified and named Gwalior, and the city that gradually developed around it acquired its name. The city of Gwalior is home to several monuments that were constructed by the former Tomar and Scindia rulers and are some of the best tourist destinations in India. 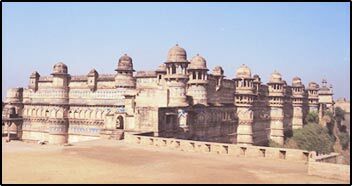 The grand Gwalior fort is one of the biggest and most graceful forts in India. There are numerous chattris or cenotaphs honoring the Scindia rulers who ruled the region before India’s independence. Apart from the Gwalior fort, the Man Mandir Palace and the Gujari Mahal are the other two interesting sights in Gwalior. The 11th-century Sas-Bahu Temples are dedicated to Lord Vishnu while the 300-metre-high Vishnu temple of Teli-ka-Mandir is of the 9th century. Apart from the tourist attractions in Gwalior the tourist places near Gwalior also speak a lot about the history of Gwalior. Datia, 74 km away, is well known for its Bundela palaces and artistic manifestations. Another place of similar importance is Pawaya, which was earlier known as Padmavati. Archaeological remains of the 1st and 8th centuries have been excavated here. The Dhoomeshwar Mahadeo temple, at a distance of 3 km, is an excellent example of Bundela architecture. Sonagiri is a well known Jain pilgrimage site. Tigra Dam is a picnic spot not far from the city of Gwalior and is more often than not visited by several tourists. Make your tour to Gwalior hassle free by opting for the right kind of accommodation for you in Gwalior according to your needs and preferences. The various hotels packages in Gwalior offer excellent facilities. The well-appointed rooms will provide utmost comfort during your stay in any one of them. You may pick your choice from a range of luxury and budget hotels in Gwalior apart from the star category hotels close to the important landmarks.